After what seemed like months of planning, the party is already over. 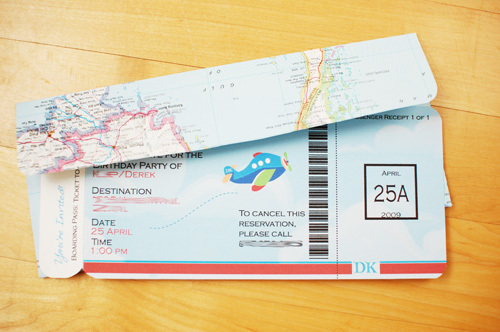 The inspiration for the party came from the invitations. Hard to believe he is already two! For the goodies bags, I painted a Cheerios box brown, I then cut two pieces of brown paper into the shape of a suitcase and attached one to either side. To dress it up a bit, I used two stripes of yellow cardstock and travel stickers. I think they turned out pretty good. 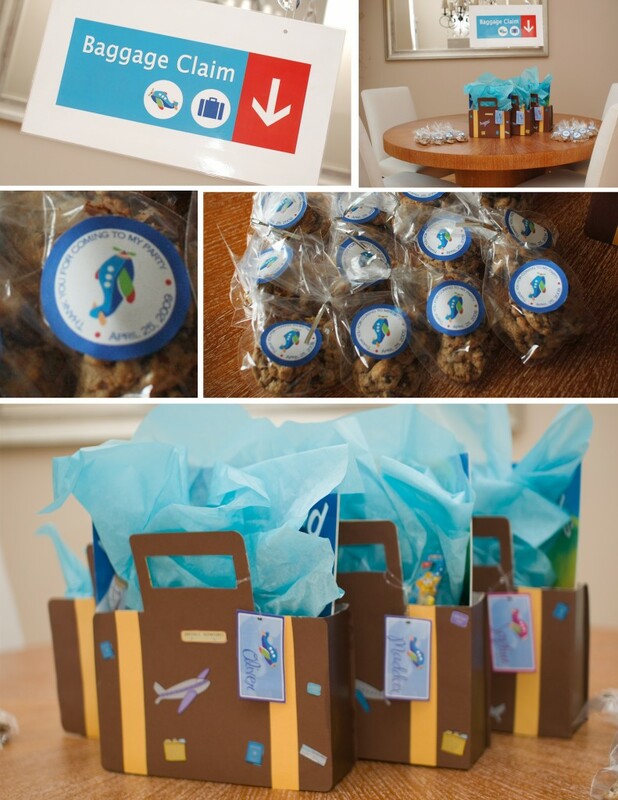 The adults were also sent home with a goodie bag, chocolate chip cookies….YUM! I have tons more pictures to sort through. I will have to show you those in a separate post. I saw your party on everydaycelebrating.com and just wanted to tell you what an awesome job you did. I was blown away by all the details! I have a TON of questions for you! I love your stickers, the breif cases, the clear plastic cases, I simply loved everything you had planned for your party! Where did you order the stickers and stuff from! My son is turning 1 and this is the theme i choose for his party, but i am having such a hard time putting it all together. your help or suggestions would be greatly appreciated! I LOVE this theme! I was wondering if you could share with me where you bought the clear plastic lunch boxes. I am having a really hard time finding them! THANKS! I found the plastic boxes as Party City. You might also check with your grocery store…they may sell them in the bakery. So how did you make the briefcase goodie bags? I’m having a birthday party for my daughter, and I’m trying to find these suitcases for goodie bags. Did you make these or did you buy them. How or where? Hi Liz, I made them from cereal boxes. I cut the box, cut cardstock into the suitcase shape, and glued it onto the box. Hi… That’s talent and creative. Thank you for responding. I’m gonna give it a try. I can’t tell from the picture, but are they little cereal boxes or regular size cereal boxes? Thanks! 🙂 They are regular size. Pretty sure I used Cherrios boxes, because they are wider. i will give this a try….